Most people wouldn't think of visiting a beach in November, but the national parks on North Carolina's Outer Banks offer more than just sun, surf, and sand. This is a place where land, sea, and air converge. The parks on these barrier islands are home to a system dependent on the dynamics of the sea. People have long called these islands home, from the very first native inhabitants and European colonists in the New World. Visit Cape Hatteras National Seashore, Fort Raleigh National Historic Site, and Wright Brothers National Memorial, three national parks that show how the land, sea, and sky of the Outer Banks have drawn people for generations. Algonquian tribes lived here for thousands of years, but new visitors arrived beginning in 1584 to seek a strategic home in the New World. 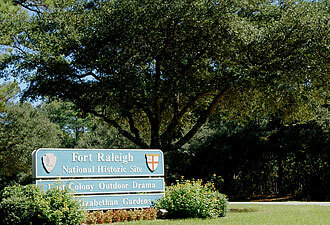 English settlers landed on Roanoke Island to begin a new colony – the first attempted English colony in the New World. While the colonists built dwellings, planted crops, and bore children, their time here was short lived. When the colony's governor returned to Roanoke Island from England in 1590, he found no sign of the colonists, and few clues as to where they may have gone. The mystery of the “Lost Colony” remains today. At Fort Raleigh National Historic Site, you can see a reconstructed earthworks, based on the original dating from 1585, and walk the wooded grounds where Algonquians walked. Roanoke Island also played an important role in the Civil War and later discoveries in science and technology. The sea drives the Outer Banks. Along the barrier islands of Cape Hatteras National Seashore, you can experience the wind and the pounding surf that have influenced these islands. Instead of beach wear, you'll want warm layers during the fall season—strong storms can quickly change the island scenery. Lighthouses are the icons of the islands. Three of North Carolina's coastal lights are located on the seashore, and the lighthouse grounds and visitor centers are open year-round. 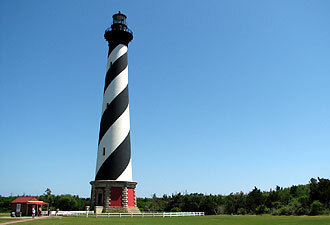 Cape Hatteras National Seashore provides a wealth of recreational opportunities. These islands boast some of the best surf fishing on the East Coast, and miles of beaches are accessible by foot or off-road vehicle. Autumn means bird migration on the Outer Banks. The Wings over Water Festival draws birders during the year's best migration. These islands lie along the Atlantic flyway, and nearly 400 species of birds have been seen on the national seashore, thanks to its varied habitats. In the fall of 1900, two visitors came to these islands “afflicted with the belief that flight was possible to man.” Brothers Orville and Wilbur Wright of Dayton, Ohio, came to the Outer Banks seeking things today's visitors still look to experience: wind, sand and isolation. Over several years and thousands of test flights, the brothers refined their flying machines, until they were ready to attempt a powered flight. On December 17, 1903, the Wrights achieved their vision and completed four controlled, powered flights – the world's first. You can visit the commemorative boulder marking the site of the first flight, and follow the flight path showing the length and duration of the four flights. 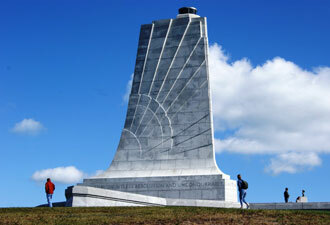 The Wright Monument offers a commanding view and commemorates the brothers' “conquest of the air.” The highlight of any visit should be a ranger's Flight Room Talk at the visitor center. Watch the ranger manipulate the wings of the replica 1903 Wright Flyer, and learn about the brothers' accomplishments that revolutionized our world. At these Outer Banks national parks, you can experience lands that have attracted people for thousands of years. Follow in the footsteps of the Algonquian Indians and English settlers, the Wright brothers, lighthouse keepers, and generations of vacationers, by experiencing the land, the sea and the air of the Outer Banks.